Inner Anatolia and its surrounding areas are a treasury indeed from the standpoint of various works of art, especially those from the Seljuk period. In addition to the monumental and impressive architectural works, which from time to time cause us amazement, each element of handiwork such as stone decorations, tiling, wood carving, and plaster decorations which completes these architectural structures is like a work of art in its own right. Of these arts, that of wood carving developed among the Seljuks in Anatolia who created an original style. This same tradition continued during the feudal period and produced important works which were done with great mastery. Foremost among the objects which have managed to survive down to the present day are pulpits, lecterns, and window and door shutters from mosques of various sizes. The wood which was worked in various ways was generally walnut, apple, pear, cedar, ebony, and rosewood. The primary techniques which the Seljuks employed in wooden materials may be listed as follows. Genuine Inlaying: This is an interlocking technique. Pieces of wood in the shape of diamonds, octagons, and stars whose centers contained raised arabesque designs were fitted into one another with grooved wooden laths which held them together. Another feature is that no nails or glue were used when the pieces were inlaid. Since the pieces are interlocking, there would be no splits or separations when then wood dried out and became smaller. False Inlaying: This is difficult to distinguish from genuine inlaying. There are no nails in the octagons, stars, and diamonds, but the laths between them are held in place with nails. When the wooden blocks dry out and shrink, splits the length of the work may appear. Entirely Interlocked and Glued Inlaying: In this type of work, wooden strips are nailed onto wooden blocks so as to create octagons, stars, diamonds, and a geometric framework. This is very difficult to detect but it becomes apparent when the pieces in the geometric frame drop out. Entirely Embossed Inlaying: This is a technique which is quite common and is frequently employed. In this group, the octagons, stars, diamonds, and the framework between are in the form of relief work on the same wooden block. The height of the relief is not very great. In time, splits will appear in objects made with this method. These works from the Seljuk period are all genuine works of art. In their survival down to the present day there have been significant losses, and even today, in some places they are faced with the danger of not receiving the attention to which they are due. This situation should make us think, because however important creativity may be in the filed of art, the preservation of a cultural asset and its transfer to future generations without its deterioration is just as important. Failing this, it becomes meaningless to speak of culture after a while. Until 1933, the pulpit remained in the mosque in good and useable condition, and it was that year that the director of the museum wished to have the work moved into the museum. Those working in the mosque and the people of Develi were unwilling to give up the pulpit and locked the mosque. However when they came and began cutting the mosque's lock with a saw (the marks can still be seen), the key was produced and handed over. 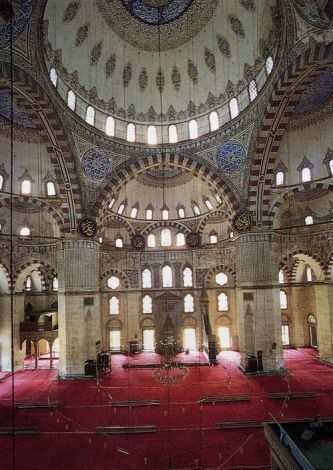 The mosque was entered, and the pulpit was removed, being horribly broken in several places in the process. What is even more interesting is that these fragments were left in a heap in the museum together with pieces of another wooden pulpit removed and brought here in the same way from TaÅ?hun Pasha Mosque in Ã?rgÃ¼p's village of Damsa. It is easy to see also that the registration of the works in the museum's records took place long after they came here from such indefinite names as "pulpit edge" "board with inscription", etc. which were given to them. Later, when the pieces sent to the Ankara Ethnographic Museum for joining were completed, the TaÅ?hun Pasha pulpit emerged intact, but it was to be noted that with the exception of a few small pieces, the Develi pulpit had disappeared. There is a rumor in Develi to the effect that the missing pieces of the pulpit are in a museum in England. Briefly then, this the story of this work of art, a few of whose pieces are in the museum today. Nevertheless, as will be seen, there is something of a resemblance between the method in which the work was brought into the museum and the way in which it is being protected there. The reason for this is that there is nothing whatsoever to protect the works from the "inspections" which visitors insistently perform by hand, or from the resulting damage. The best examples of this are the on-the-spot tests for strength and comfort which visitors subject a number of works such as mother of pearl inlaid Ottoman chest and chairs. In addition, owing to the lack of doors on the exists to the rooms, the works to a certain degree may be regarded as being displayed in the open air. The important features of these works may be listed as follows. Door Frame: This is from the Develi Grand Mosque. Made from walnut using an interlocking inlay technique, the shutters are lost. The illuminated veneers have been fixed in place on the main body by means of hidden nails. Inscription Borders: There are four of these. Since they were removed from the pulpit by being broken off, their edges have been damaged, and only some of the verses on them can be read. The second piece is the continuation of the verse. The third piece is the beginning of Verse 11-285 of the Koran. The fourth piece the continuation of that verse. The inscriptions are done in deeply carved Kufic style calligraphy, and the areas between have been filled in with convoluted Seljuk motifs. These inscriptions are the product of extremely beautiful and painstaking workmanship. It is believed that they were from the sides of the pulpit, the railing, and the plinth. Pieces from the Railing and Sides: The pieces of the railing, which are believed to have been produced by a carving technique of which they are successful and beautiful examples. The work is the result of the carving of eight and five-pointed stars, and of octagons and hexagons. There are grooved braids in the form of a second level of geometric decoration which rise an wander around and among the carvings. As for the pulpits side panels below the gallery, these were also made using an interlocking technique. They are decorated with illuminated pentagons and quadrangles, while the upper part is in the form of a geometric composition produced from double grooved intervening strips. Along the edges of the decorations there is a row of small circles. The edges of the pieces weight down on the intervening laths, and the whole has been fixed to the main body behind by means of invisible nails through the carvings in between the decorations. The pieces have never been painted, and it's interesting that they should have survived to the present in the condition of their original manufacture. There are no records or documents whatsoever related to the person who made the pieces of the pulpit or to when the pulpit was made. Nevertheless, the date of the mosque's construction -1281- could be taken as being an approximate date for the manufacture of the pulpit. This pulpit is an example of beautiful workmanship, and at the same time, of bad luck. We hope that such a work will be protected with greater care and in a manner which will spare it from damage.